Scenes From a Mall | Inventing Situations. I’ve never been a hang-out-at-the-mall kind of person. The prices are higher than things I can find in the internets or strange alleys, the food courts unappealing, and the general level of “shiny” doesn’t really match my self-concept. And yet, during my year in Kenya, I spent a lot of time at various malls. When staying in Nairobi, I would find myself in a mall every other day, it seemed. And it makes sense in retrospect: The specialist shops and on-line stores where I usually use to get my obscure electronics aren’t available in Kenya, and food safety seems a bit more reliable in the malls. The biggest factor, though, are the coffee shops. I spend a lot of time in coffee shops wherever I travel, unwinding thoughts and sketching proofs and sipping on a simple black Americano. And most of the coffee shops in Kenya are in malls. 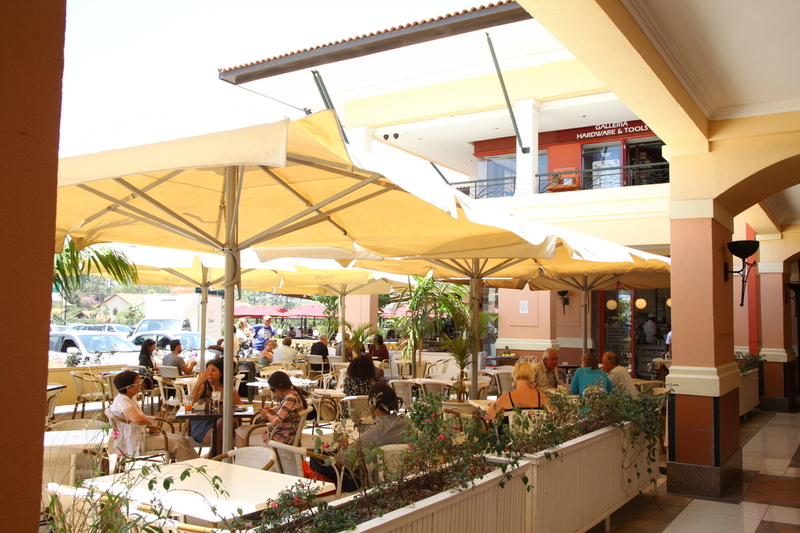 The mall I spent the most time at in Nairobi was The Junction, and most of that time was spent at Art Caffe. It’s a space with a great slice of the mix of modern Nairobi. Yeah, there are a lot of jackass travellers like myself plugged into their laptops, but just as many people stopping through for a business lunch, mommas chatting about their kids, young people hanging out with friends, and men from unidentifiable Eastern European countries discussing possibly shady business in an unidentifiable language. It’s a great cross-section. It’s also a bit of an escape. After not-so-very-much time in Kenya, I found myself very often feeling like a target, or at least a potential target. Crime isn’t nearly as bad as it was in the 1990’s, but you still here quite a lot about muggings and organized thefts on public transport. Car-jackings still happen from time to time. And occasionally you hear about more esoteric crimes, like an entire bus being hijacked and everyone on it systematically robbed. The Embassy’s security briefing said, in brief, that you’re kind of crazy to walk around Nairobi. I still walked, at least when it was light out. But I used the public transit in Nairobi a bit less after one of my neighbors was in one of those bus hijackings, and another friend had many of her things stolen. It’s the kind of thing that you try to keep from affecting your behaviour too much, but the stories add up over time. Beyond crime, though, there’s the con men and the hustlers, the people looking for an in on a handout or something bigger. There’s a whole rainbow of activity here. There’s the innocuous kid asking for money, ranging up to the guy in downtown Nairobi who collects esoteric information about universities in America to fuel a story about needing plane fare for the school that you just coincidentally happen to be associated with. And a hundred shades in-between. I met piles of wonderful people in Kenya, but meeting new people – especially in unmediated contexts – was often accompanied by this question of whether someone was looking for an actual interaction,or just wanting to get something from me. And, yeah, the retailers at the malls want me to buy some sparkly things, but at least the terms of engagement are clear. The coffee shops at the malls were generally pretty free from hustle, though. Pretty simple, really; the malls are where the affluent Kenyans hang out, and they don’t need to beg or steal from random strangers. I’m sure I’m not alone in feeling like a target in Kenya. It’s a country of walled gardens. The Naivasha Country Club is a good example. It’s a beautiful colonial building with a huge lawn, where you can relax for an afternoon sipping your gin and tonic before taking a boat ride to see some giraffes. In colonial times, only whites and their servants were allowed into the club. Today, anyone can go, but the steep prices even for entry have turned a race barrier into a class barrier. Inequality is a massive issue in Kenya, where any house of the slightest affluence will be enclosed in a wall. Add a little more money, and you’ll have an armed guard or two. Inside the walls you’ll find well-manicured hedges, and outside you’ll find all the glorious chaos and conundrum that is Kenya at large. One thing that struck me in reading Ngũgĩ wa Thiong’o‘s beautiful novel ‘Wizard of the Crow’ was that all of the characters who accrued any wealth felt instantly surrounded by scheming, invisible enemies, hell-bent to bring the successful (if hopelessly corrupt) man back down to their level. Or at least get a slice of their pie. But there’s also a growing middle class in Kenya, people who aren’t quite mansion-builders, maybe a little bit better off than a school teacher, who have a bit more than enough to get by. And the malls provide a kind of public walled garden for this new middle class. It’s not quite the fortress that you run into at, say, the UN compound, and the class wall is a bit more permeable than at the Naivasha Country Club. There’s no explicit entry fee, though you should probably buy a cup of tea if you plan to stay for long. But the flip side of being a somewhat more open space is that the security is by necessity compromised. It’s easy to get in and out. The security often consists of a guard at the entrance pointing a beeping metal detector and waving you through in the same gesture. As a result, the US has been warning that the malls are a prefect spot for a terrorist attack for years. It’s a symbol of what affluence the country has accumulated, the security’s lousy, and it’s an important cultural space (consumerist as it may be). So when fifteen terrorists blew into the Westgate mall a few days ago, starting their siege just next to the Art Caffe, the news was at once startling and kind of unsurprising. Westgate is probably the second-flashiest mall in Nairobi, but a better target than Village Market, which is set up for wives of diplomats and within spitting and firing distance of most of the major embassies. The few times I’ve been to Westgate I was taken aback by the scale and the flash and the sheer number of people there. And judging by the racial mix, it’s extremely popular with Kenyans. I also feel very lucky that I didn’t know people trapped or killed in the attack; amongst the peace corps volunteers, ex-pats, and awesome Kenyans I know in Nairobi, everyone seems to be doing ok. There’s a sense of a near miss, though: this could have been just about anyone at the mall that day. The source of the attack is also unsurprising: Al Shabab has been lobbing grenades into market places for years, though this is the first time they’ve carried out a terrorist attack on this scale. The situation along the Kenya-Somali border is quite tense, with Kenyan troops active on the Somali side, and fairly common attacks by Somali militants on the Kenyan side. During my security briefing, we were showed a big map with a bright red zone along the Somali border. Going to the red zone without clearing it first would mean getting sent home: In my work with Fulbright, I think this was the just about the only hard rule that was stated. In recent years, Al-Shabab has been recruiting Kenyans and other East Africans, to allow freer movement across borders. The walled garden itself becomes the target, under siege by invisible enemies. Tom, you are a great writer. (I mean this very genuinely. I read a lot of blogs and this post is awesome.) I hope to read more about Kenya, your experiences are fascinating! Thanks for expressing your thoughts. I, too, have spent many, many days at malls in Nairobi, especially Westgate. It’s beyond comprehension what happened this week and to think, “That could have been me”.